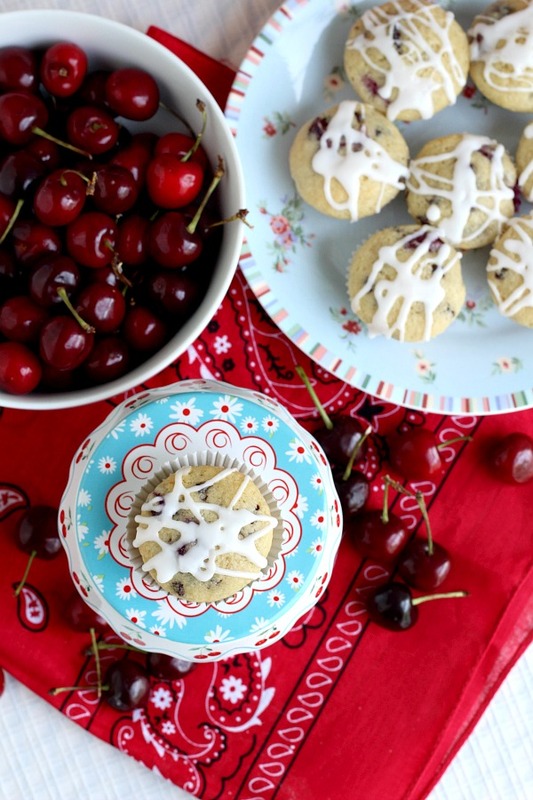 The beginning of summer means it is the beginning of cherry season. That is pretty special for folks like me who love fresh cherries. I also love muffins so combining the two was a natural. 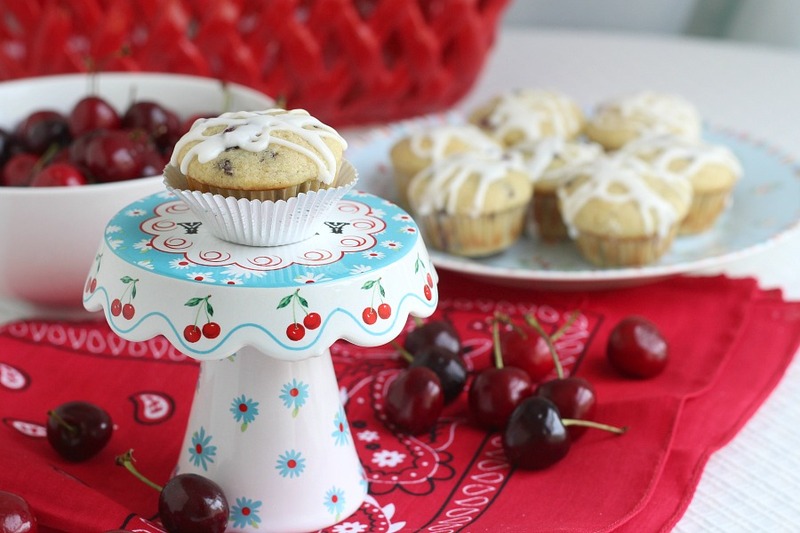 I couldn’t leave it there so I tossed in some mini chocolate chips to make a batch of delicious glazed Cherry Chocolate Chip Muffins. They are perfect for breakfast or afternoon snacking. Baked in mini muffin pans and just the right size to take to work and enjoy during a coffee break. 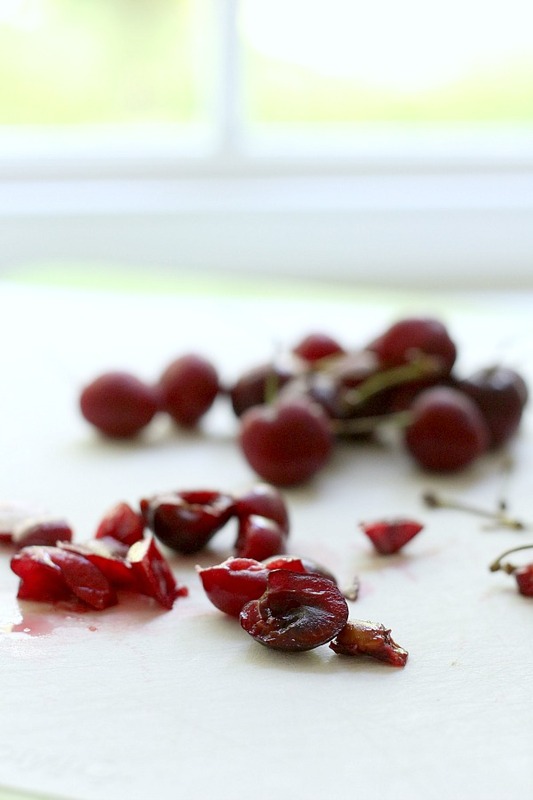 Start by cutting the fresh cherries into small pieces. To reduce calories and fat in these muffins, I substituted half of the butter with unsweetened applesauce. If you would like a richer muffin, use all butter. Whisk together the dry ingredients in a large bowl and the wet ingredients in another. Pour the wet ingredients into the dry and using a silicone spatula, fold gently. 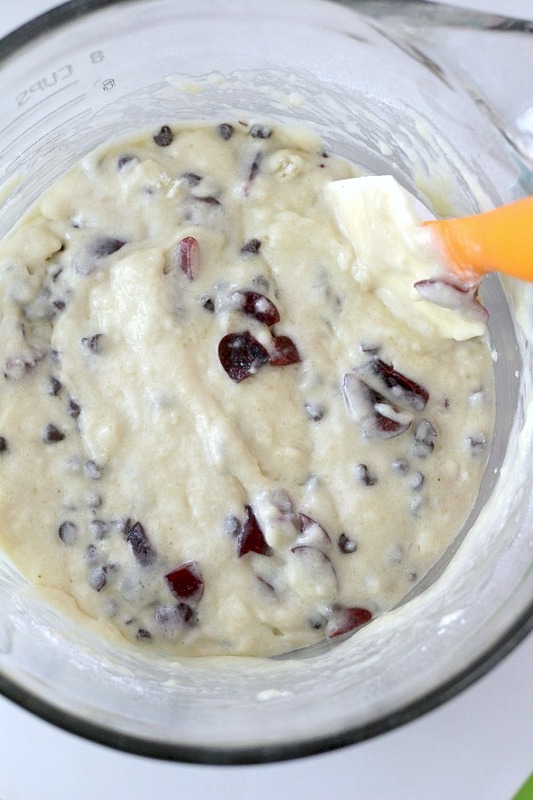 Add the cherries and chocolate chips and fold in. 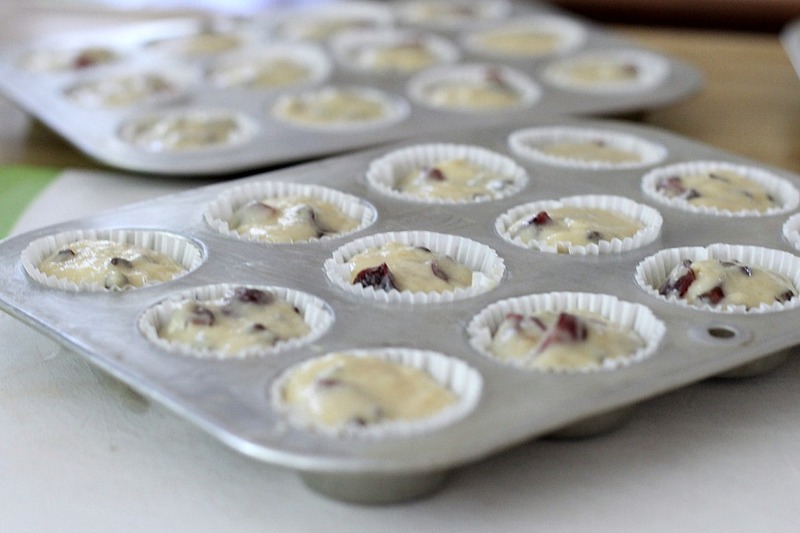 Use a small scoop or tablespoon to fill the mini muffin pans with batter. Bake until a toothpick inserted into the center of a muffin comes out clean. Cool in pans on a cooling rack for 10 minutes and then remove muffins from pans and cool completely. Combine glaze ingredients and drizzle on muffins. Position oven rack in the center of oven; heat to 350 degrees F.
Lightly grease the top of mini muffin pans (see RECIPE NOTES below) then line with paper or foil baking cups. In a large mixing bowl, whisk the flour, sugar, baking powder, baking soda and salt until well combined. In another mixing bowl, whisk together the buttermilk, egg, vanilla and almond extract; Add the butter and applesauce and stir. 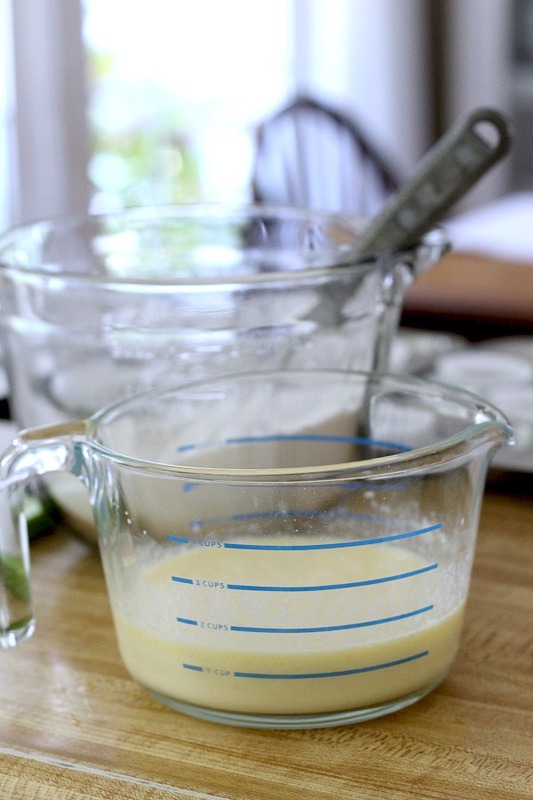 Pour the buttermilk mixture into the dry ingredients; with a silicone spatula, gently fold until almost blended. 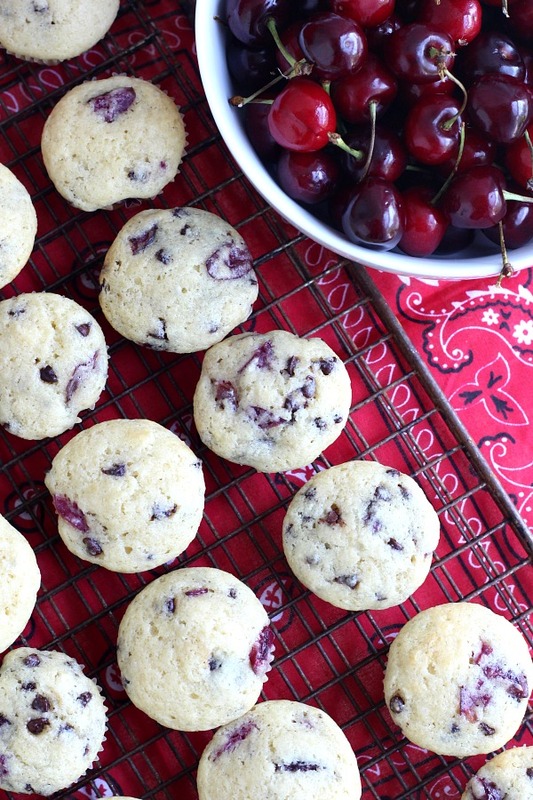 Add the cherries and chocolate chips and gently fold being careful not to over stir the batter. Using a small scoop or slightly rounded tablespoon, fill the muffin pans evenly. Bake in preheated oven about 13 minutes or until a toothpick inserted comes out clean. Remove from oven to a cooling rack for 10 minutes. 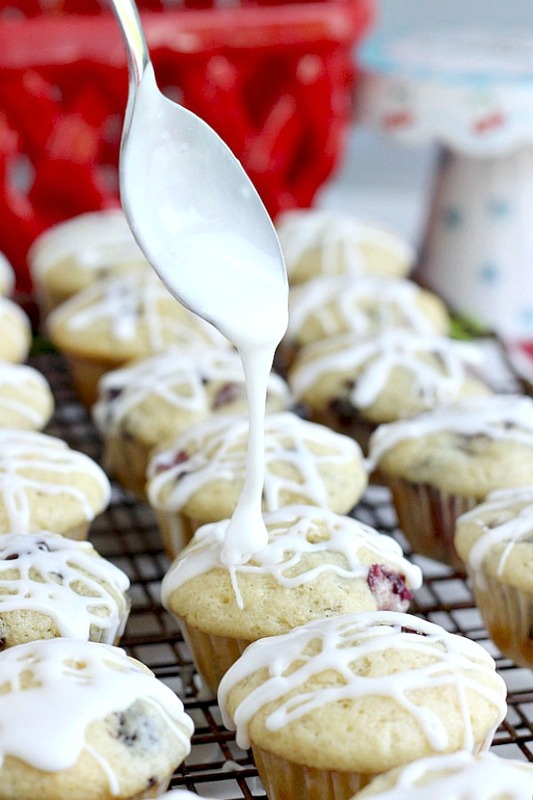 Remove muffins from pans and cool completely before glazing. In a small bowl, stir together the glaze ingredients until smooth. 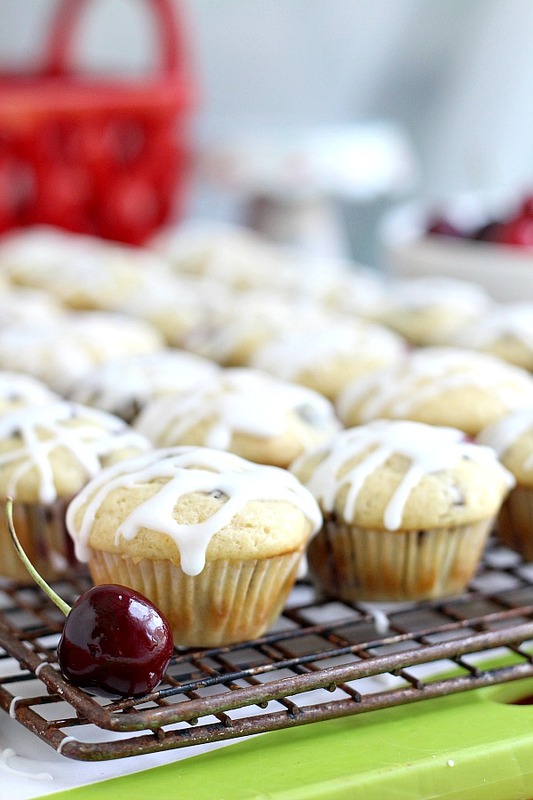 Drizzle on cooled muffins. 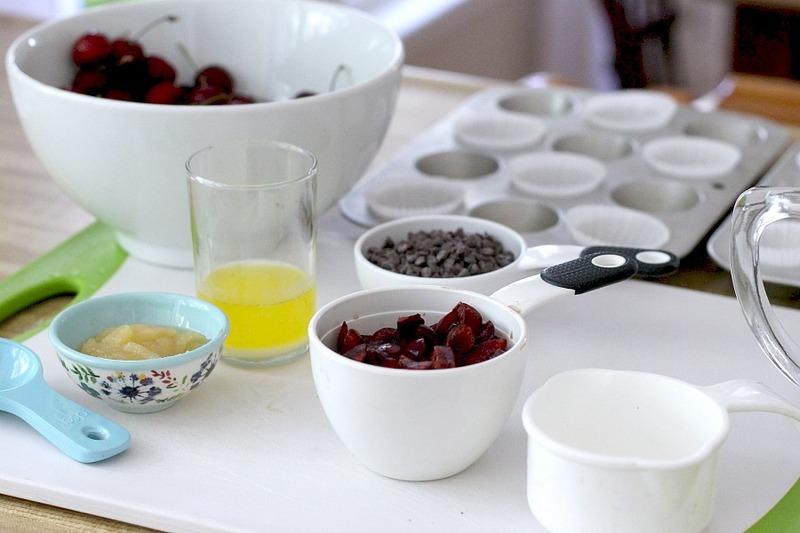 My mini muffin pans each make 12 mini muffins. Larger pans make 24 muffins. I got 31 mini muffins from this recipe so I used three pans. If you will be baking the muffins in batches, be sure to allow the pan to cool before adding batter. I have not made standard size muffins with this recipe but when I do I will update the baking time and batch yield. Because these muffins have reduced fat (since I substituted applesauce of part of the butter) they might stick to the cupcake papers. Batters that are relatively low in fat tend to stick more than higher fat recipes. This was more of a problem when they were first baked. 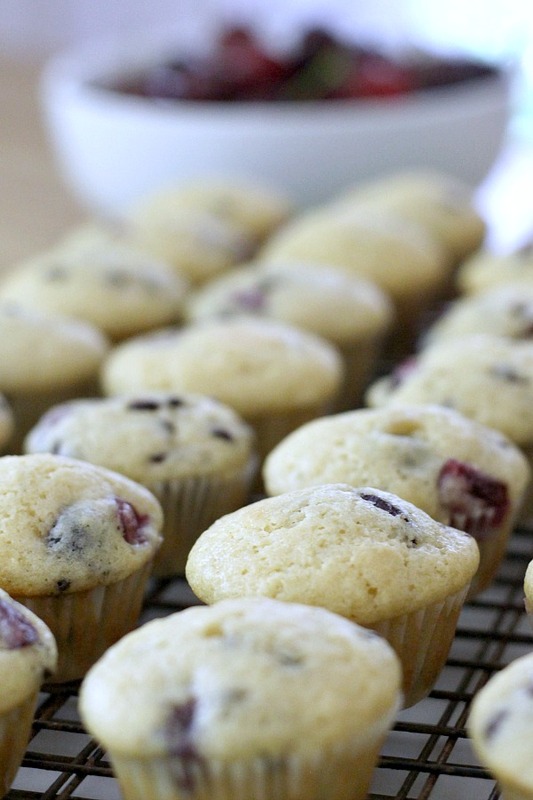 Allow the muffins to cool completely before you try to remove them from the paper cups. 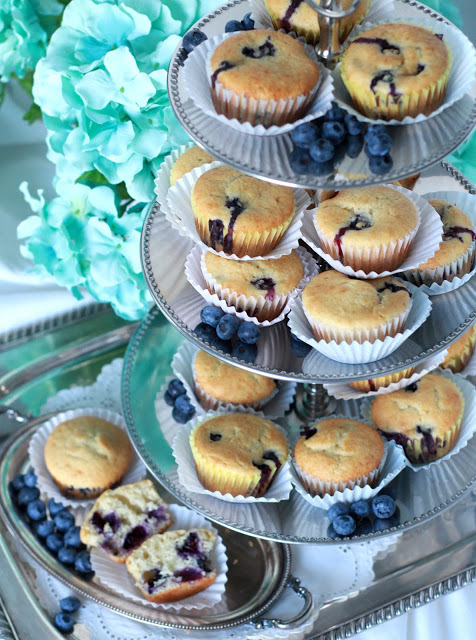 Cakes and muffins shrink a bit as they cool, so they’ll actually loosen their grip on the paper cups slightly as they come to room temperature. 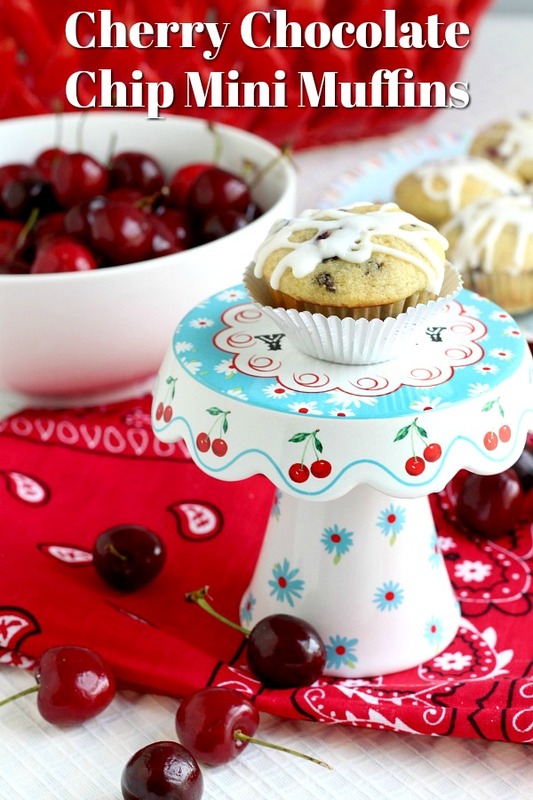 Grease your cupcake paper cups. Give the paper cups a light spray of non-stick cooking spray before filling them. Do not use paper liners but grease the muffin pan before filling with shortening or non-stick spray. I have not tried this but I don’t see why it won’t work. Do not use applesauce but instead make the muffins using all butter (6 Tablespoons). I haven’t tried this either.